~ Accessory Mounts The CAD developed sliders are built on an “aircraft wing” type of construction. The outer “skin” or shell is precision laser cut 3/16” steel and formed on CNC forming equipment. On the inside a combination of ¼” and 3/16” inner ribs support the outer shell. This produces and extremely rigid, relatively light weight main body for the slider. The forming of the slider shell also allows for it to flow with the rounded lines of the 80. The CAT GUARD is precision laser cut and formed from one solid ½” thick steel plate. 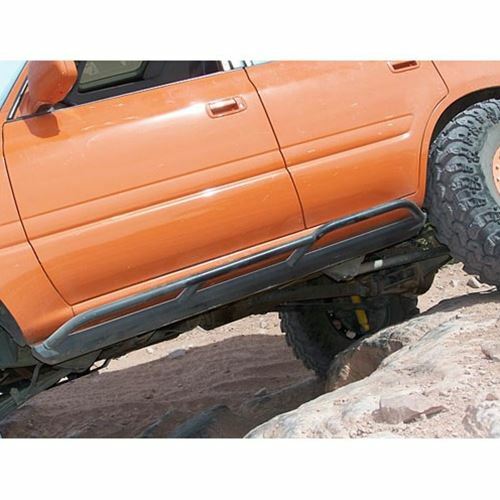 The guard acts as a large ski to protect the expensive catalectic converter and not hinder forward motion off road. The guard allows the most air movement of any other design and will not collect trail debris. The main thing is allowing maximum air movement to allow heat to be bled off; excessive heat will destroy a cat. Bolt on a 2.5-gallon air tank or mount up a spare Optima battery all tucked up under your truck. For night off road travel use the four rock light tabs all pre-installed ready to go. Since the slider is a wing design you can route all the wiring cleanly inside the slider! The right side slider has an accessory mount built into it to capitalize on the large open cavity under the right side floor just outside of the frame rail. By using the optional accessory mount/skid plate you bolt the mount directly to your sliders and frame. The mount holds either a 2.5gl air tank or a spare Optima battery. The mounting plate is laser cut and formed out of ¼ inch plate and acts as a skid guard for what is mounted above it. All this is tucked up above the main body of the sliders. Rub rail: The outside of the slider has a two-stage rub rail. The aft portion of the rub rail is 1.5” further outward that the front half. This area of the slider will push the back end of your truck away from the obstacle you are traversing (This helps save your ¼ panel)! Mounting: Each side uses three main points distributed down the body of the slider. Each mounting point bolts solid to the frame. Five of the mounts borrow the commercial trucking industries standard for 50+ years of mounting accessories to truck fames, the U-bolt. Hardware: Custom made grade 8 U-bolts and grade 8 cat mount bolts. Finish: Complete wash, pre-bake and sandblast before the two coats of military specification black powder coat are sprayed and baked on. Both the inside and the outside of the sliders are powder coated, the only ones in the industry like this. Bottom line: The new Metal-Tech FZJ80 sliders truly are “Protection Evolved”.